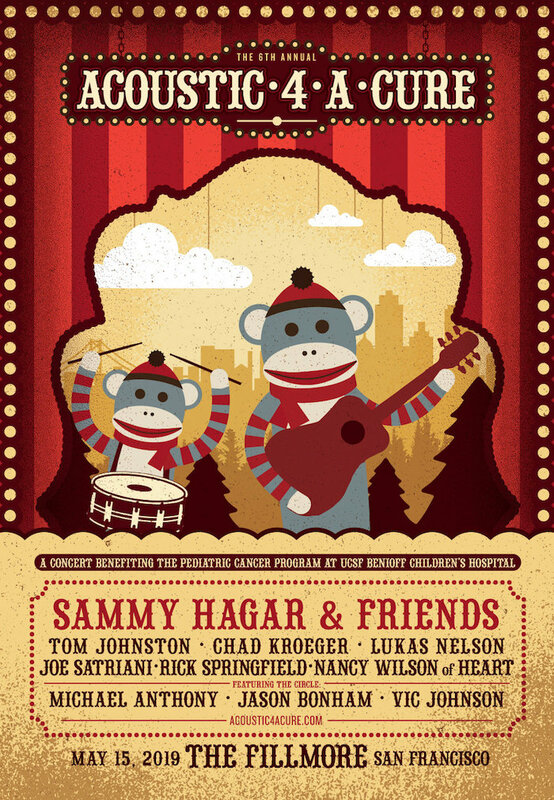 SAN FRANCISCO, March 18, 2019 — Sammy Hagar today announced the line-up for the sixth annual "Acoustic-4-A-Cure," benefit concert on May 15 at The Fillmore in San Francisco. Artists performing at Acoustic-4-A-Cure VI include (in alphabetical order): Tom Johnston (The Doobie Brothers), Chad Kroeger (Nickelback), Lukas Nelson, Joe Satriani, Rick Springfield, Nancy Wilson (Heart) and Sammy Hagar & The Circle, featuring Michael Anthony, Jason Bonham and Vic Johnson. Acoustic-4-A-Cure is a concert benefiting The Pediatric Cancer Program at UCSF Benioff Children's Hospital. Tickets will go on sale Friday, March 22 at 10AM PDT at https://concerts1.livenation.com/event/1C005667C67C5D17 . There is a 4-ticket limit per customer. Every ticket purchased will include one (1) CD copy of Sammy Hagar & The Circle's new album Space Between. Customers who redeem the CD will also receive a digital copy of Space Between. Ticket purchasers will receive instructions on how to redeem their copy that will be mailed to them on May 10th. Now in its sixth year, Acoustic-4-A-Cure has quickly become one of the year's hottest tickets, with legendary artists performing acoustic sets, epic collaborations and impromptu jams from the stages of intimate and storied San Francisco venues like The Fillmore. The benefit was created by Bay Area rock legends Sammy Hagar and James Hetfield, whose vision was to raise needed funds and awareness for the pediatric cancer research by throwing a must-see concert for fans and donating all of the proceeds to UCSF Benioff Children's Hospital. In past years, artists including Billie Joe Armstrong, Pat Benatar & Neil Giraldo, Jerry Cantrell, Kevin Cronin, Melissa Etheridge, Mick Fleetwood, Dave Grohl, Sammy Hagar, James Hetfield, Vic Johnson, Tommy Lee, Taj Mahal, Sarah McLachlan, Pat Monahan, Linda Perry, Chad Smith, Adam Sandler, Joe Satriani, Bob Weir, Nancy Wilson, and more have performed remarkable sets. Below are images and videos from the 2014, 2015, 2016, 2017 & 2018 concerts. Fan-posted videos have garnered 10+ million views. Dave Grohl, Taylor Hawkins & Rami Jaffee Premiere new Foo Fighters song "The Sky Is A Neighborhood"
Sammy Hagar & Vic Johnson "Right Now"